Take your creativity and productivity to the next level with the advanced features and uncompromising quality of the Epson Stylus Photo R2000. This robust, 13”-wide printer delivers remarkable efficiency and versatility with high-capacity cartridges, and networking and wireless connectivity, along with flexible media handling. Epson UltraChrome Hi-Gloss 2 pigment ink, delivered through Epson’s Advanced MicroPiezo AMC print head, yields beautiful archival prints with an unprecedented glossy look and feel. Offering the latest in wired and wireless networking, the R2000 makes it easy to print from anywhere in your home or office. Now, you can take your creativity further with the next generation in high-performance, pigment printing technology. Achieving high-level creative results is a daunting task. It begins with you — your vision, your eye, your imagination. And it ends with the tools you use to bring those ideas to life. Which is where the Epson Stylus Photo R2000 comes in. It includes advanced features and quality you’d expect in a professional level printer — pigment-based inks, significantly larger capacity cartridges and flexible media handling. You can also print anywhere in your home office or studio with both Ethernet and Wireless-N connectivity. And the closer you look, the more advantages you find. This 13-inch wide ink jet printer also includes Epson UltraChrome Hi-Gloss 2 Ink and a revolutionary MicroPiezo AMC print head. Together they combine to create exceptionally high quality prints with an unmatched glossy look and feel. When it comes to performance and productivity, the Epson Stylus Photo R2000 will take your creativity to the next level. Hi-Gloss technology that really shines. The Epson Stylus Photo R2000 features a remarkable 8-color pigment ink set that delivers unprecedented print quality you can share for a lifetime. The High-gloss Microcrystal Encapsulated inks include instant-dry properties and immediate color stability to ensure archival prints that are highly smudge, fade and water resistant. In addition, auto-selecting Photo and Matte Black inks deliver the deepest blacks and boldest colors on matte and photographic media. Ink capacity for up to 50% more prints. 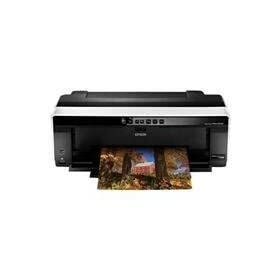 The Epson Stylus Photo R2000 offers true professional productivity with significantly larger capacity ink cartridges that can produce more prints between cartridge changes. This means less downtime and improved productivity. And, each color has its own individual cartridge so you replace only the one you need. The Epson Stylus Photo R2000 comes with advanced connectivity features that enable you to choose the setup that suits your needs. Use the built-in 100 Mbit Ethernet for wired networking or the latest in Wi-Fi CERTIFIED 802.11n technology for the fastest wireless connectivity to date. If you prefer a direct connection, the R2000 also offers Hi-Speed USB 2.0. With this kind of flexibility, you have the convenience and peace of mind that comes with knowing you can print anywhere the need arises. Created through a collaboration between Epson and the Rochester Institute of Technology’s Munsell Color Science Laboratory, AccuPhoto HG imaging technology combines a complex mathematical architecture with advanced screening technology using Epson UltraChrome Hi-Gloss 2 Ink to ensure outstanding image quality even when printing in higher speed modes. Epson UltraChrome Hi-Gloss 2 includes Red and Orange inks to ensure an ultra-wide range of colors and smooth, vibrant skin tones. Additional enhancements to the ink set deliver lush greens and richer blues. The Advanced MicroPiezo AMC print head also features an ink-repelling coating which improves print quality and increases reliability. 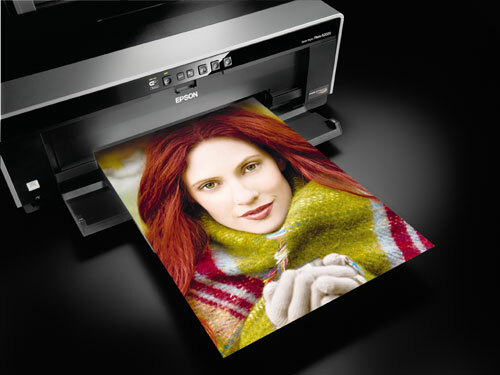 Like all professional quality printers, the Epson Stylus Photo R2000 supports a full range of media. It can print BorderFree photos from 4" x 6" up to 13" x 19" in popular photo and paper sizes, including 12" x 12". 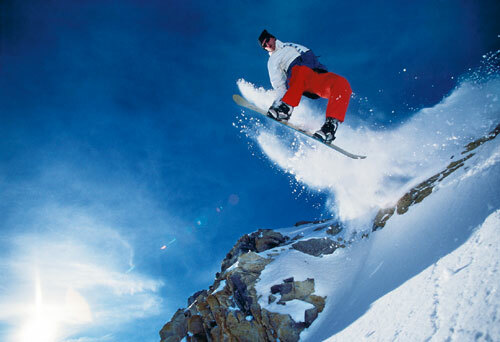 It easily handles glossy, luster, matte and fine art media, including canvas. 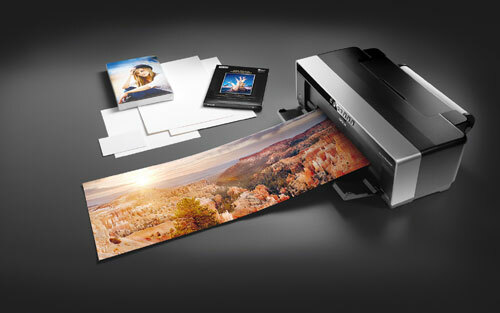 It also accommodates 1.3 mm thick board, ink jet printable CD/DVDs and roll paper for panoramas up to 13" x 44". Whether you’re printing a series for gallery display, a comp for presentation or a customized CD or DVD, the Epson Stylus Photo R2000 has the capability and versatility to deliver outstanding results to even the most particular individuals. Packaging Specifications (W x D x H) — Dimensions: 24.5" x 12.8" x 8.6" and Weight 27.5 lb.